Logic Hop Conditions are used to perform actions such as which content to display or when to set a goal. Conditions can be thought of as questions answered by Logic Hop. Each question consists of one or more values which are compared by a comparison operator. The answer to a condition is either true or false which can be thought of as yes or no. For example in the following condition, Day of the Week and Friday are the values and equal to is the comparison operator. View all condition types and comparison operators. Congratulations! Your condition is now ready for use. 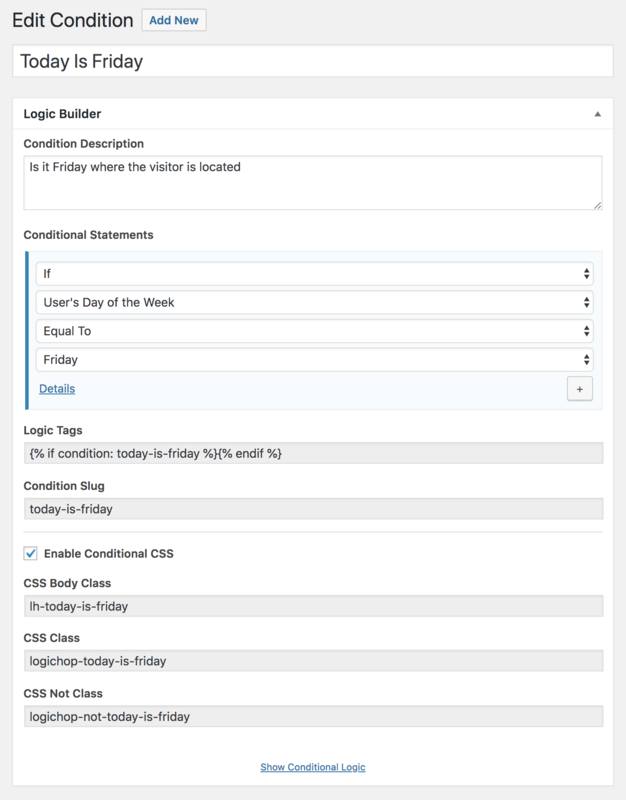 Learn how to use conditions with pages & posts. Multi-Statement Conditions consist of two or more conditional statement blocks. Each block adds another question to the condition. Congratulations! Your multi-statement condition is now ready for use. Note: To remove a conditional statement block click the Remove link in the lower right corner of the block you want to delete. Conditions can be evaluated with PHP for use in themes and plugins. Pass a condition slug or ID into the __$logichop->get_condition()__ function. If the condition is met, true is returned, if it is not met, false is returned. The following example returns true if the condition slug today-is-friday is met or returns false if it is not met. Click Conditions under the Logic Hop menu in your WordPress Dashboard. Click Trash under the title of the condition you want to delete.